At Rhino Van Hire we have a huge range of vehicles to cater to your every need. With hundreds of van rental branches inthe UK, Rhino Van Rental is confident that no other website can match us for choice or quality. This is because we have the biggest search database for vans in the whole of the United Kingdom, including branches in Scotland and Wales. At Rhino Van Hire we match up our availability with your convenience. With so many branches there is bound to be one close to where you live. All you have to do is enter the location which you will find most accessible and then search for it on our website. * What size van do I need? 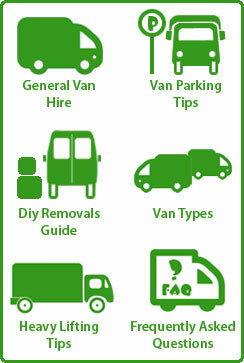 This instant service at the click of a button is designed to make your van rental hassle free. It means that you won’t have to wait around should you need to transport something urgently, make a large delivery, meet a deadline or even move house!!! However, we don’t expect everyone who rents a van to have used one before, or even know what type of van they need. This is why Rhino Van Hire takes you step by step through your requirements so that we can match up our vans with your needs. You can rest assured that your safety and security is of paramount importance to us and our website also has in depth guides so that we can help you with any queries and questions that you may have, please call us on 0844 2259 160 if you need any further assistance. Driving a van can be quite a different experience from driving a car so for those who have never done so we aim to make sure that you are as prepared as you can be. One way in which we try to make things easier for our customers is to produce jargon-free guides so that we can make everything as clear and simple as possible. This is all part of our commitment towards saving you time, allowing you to concentrate on getting your job done without having to stress about hiring a van. One thing you can be sure of is that Rhino Van Hire is dedicated to giving you the lowest possible prices for van hire and we have a number of year round special offers which are sure to save you money. We currently provide van hire from more than 100 convenient locations throughout the United Kingdom, including England, Wales and Scotland. Whether you need a van to do a job, move house or carry your possessions from one place to another, Rhino Van Hire can give you the perfect van to carry out the task. See our simple procedure at a glance. Here's how to rent from Rhino. choose a van from the list. print out the reservation confirmation. with your Rhino Rental! Collect the vehicle from the rental location. Copyright © 2013 Rhino Van Hire. All Rights Reserved.